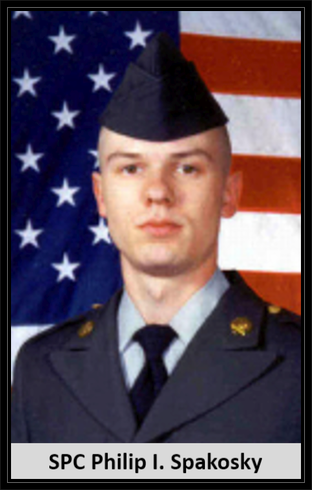 Hometown: Browns Mills, New Jersey, U.S.
Died: May 14, 2004 in Operation Iraqi Freedom. Unit: Army, 1st Battalion, 37th Armor, 1st Armored Division, Friedberg, Germany. Army Specialist. Killed in combat operations. Lived in in Browns Mills, New Jersey. Joined the United States Army in January 2002 at Fort Knox, Kentucky. Philip was assigned to the Army's First Battalion, 37th Armor, First Armored Division (also known as 'The Bandits') based in Freidberg, Germany. Deployed to Iraq in May 2003.
lSpec. Philip I. Spakosky, the second Pemberton Township High School graduate killed in the war in Iraq, was an "all-American" who joined the Army in hopes of getting a higher education, his father-in-law said yesterday. Spakosky's wife of two years, Lakisha; their daughter, Mariah, 3; and his stepchildren, Ajohn, 6, and Imani, 7, remained in Germany, where the soldier's unit was based in Friedberg before deploying to Iraq a year ago. Funeral arrangements were not complete, but a memorial service was expected to be held in Germany, followed by a local one sometime next week, said Floyd Grant, Spakosky's father-in-law. "He was an all-American great guy," Grant said. "The four or five years I have known him, I can't say anything bad about him. Just a great guy." Spakosky, of Browns Mills, joined the Army in January 2002 with the aim of getting an education under the GI Bill, said Grant, also of Browns Mills. 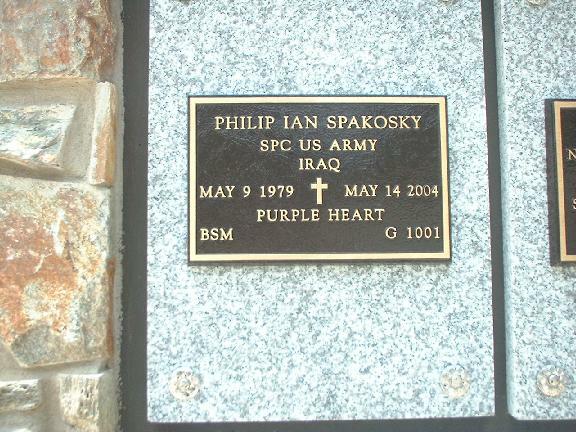 Spakosky, 25, was an M-1 tank crewman assigned to the First Battalion, 37th Armor Regiment, First Armored Division. Nicknamed the "Bandits," the regiment deployed to Iraq last May. It is among the units that planned to leave at the end of April but were ordered to extend their tours of duty. In recent days, First Armored Division troops have been fighting militiamen loyal to Shiite clergyman Muqtada al-Sadr in Karbala, where Spakosky was shot by a sniper Thursday. The Army yesterday reported that another member of the regiment, Second Lt. Leonard M. Cowherd, 22, of Culpeper, Va., was killed Sundaywhen attacked by sniper fire and rocket-propelled grenades while securing a building in Karbala. Spakosky graduated from Pemberton Township High School in 1997, and teachers there described him as a quiet, hardworking student. Another member of the class, Army Spec. Ryan Travis Baker, 24, was killed in November when two Black Hawk helicopters collided in Iraq. Before joining the Army, Spakosky drove a truck for a dairy in Tennessee. In October 2001, he escaped serious injury when he apparently lost control of his trailer truck, which flipped and slid 100 feet on the highway before hitting another truck, according to a report in the Chattanooga Times Free Press. The driver of the other truck was uninjured, and Spakosky was treated at a hospital and released.